As you can see our garden is a bit challenged when it comes to space. We are renters right now and we consider ourselves lucky to have the space that we have. 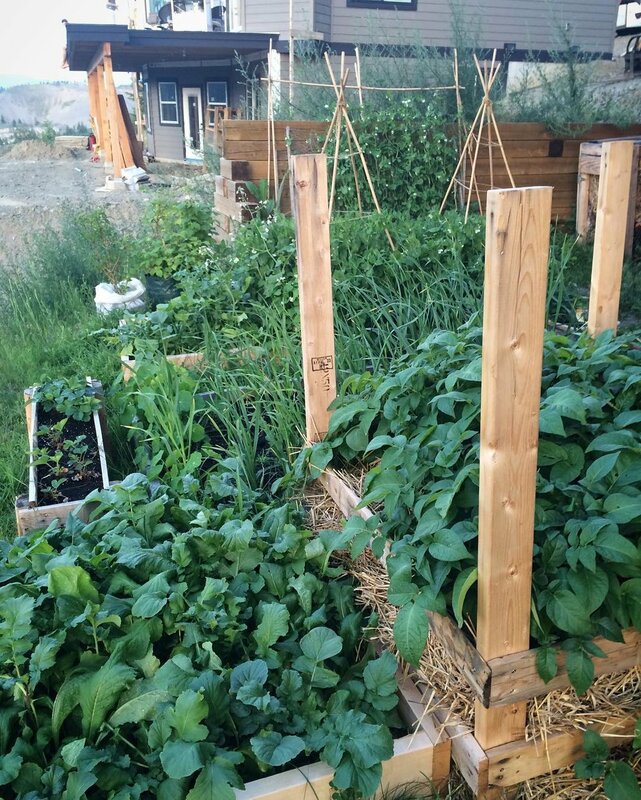 I could just go at gardening as more of a hobby, but I consider it a personal challenge to try to feed my family as much as possible from our tiny little plot. One important step to this is encouraging vertical growth whenever possible. This makes peas and beans no-brainers, but there are some other veggies in this category that might not be initially thought of. One of these is potatoes. This is our potato bin. I wish I took a photo of it right at the beginning, but I wasn't thinking of writing a blog post about the project at that point so that got neglected. Basically we used a couple pallets and Mr. Foraged and I worked together on an idea that might work. I've grown potatoes in grow bags before, and grown them in a raised bed with the more traditional method of 'hilling up'. This potato tower method was sort of a combination of the two. I was also influenced by some reading I did on other traditional ways people grew tomatoes - one of which was to grow them in straw. This was the real key to keeping our idea cost effective! What we ended up doing was screwing together a four by four square with four posts going up from each corner. We then covered the ground inside it with newspaper to discourage weeds, and then covered that with a few inches of good manure and compost. We planted our potatoes in that and then covered it with a good six inches of straw. Then as the potatoes grew we kept adding slats and filling it up with more straw. I made sure to keep a few inches of the potato leaves visible from under the straw to make sure the plants still had access to sunlight. A major benefit to this method - aside from saving cost and space - that I can see is that the job of harvesting should be much easier! I'm thinking we'll spread out a tarp and then unscrew the slats on one side and then just pull everything out. The potatoes should be pretty clean from just growing in straw, and we won't accidentally poke any with a potato fork. It will also make it really easy to get in to grab a few early baby potatoes! Of course it remains to be seen if this even works for growing potatoes. So far we have beautiful looking plants, but I don't know what is going on underneath right now. We'll have to wait and see! I will definitely update when it comes time to really put this method to the test!